My new friend Seamus Kearney of Shameless Words has begun a writing circle. Blah blah blah, happens every day right? Uh huh. Did I mention there are lions? The one and only Shameless Lions Writing Circle, in the words of Seamus, “aims to bring a lion’s prestige and pride to some lucky creative writing and books blogs.” Seamus selected 48 lions for adoption, and as I type this, 28 have been adopted, so if you’re a writer and/or avid reader and want to be involved, go here to see what this is all about. In short, you’ll be able to choose, adopt, and name your lion, and then you will be invited to write a piece of poetry or prose inspired by him or her, maximum 48 words, to post on your blog. It’s a great way to connect to other writers and wordlovers, so even if you won’t be joining the circle, I do recommend checking out the participants’ lion-inspired verses. ended up on his sleeve.Oh yeah? Then how do you explain that nose-shaped smear? This is wonderful Sognatrice! 🙂 Your lion looks right at home and your poem is great. I can’t say I like poetry but yours was just (w)ri(te)ght. Cute but not too cute. I’ve missed reading your writing the last couple of days- thanks for returning, and for your poetry. I like Leonardo. Leonardo is a sharp looking lion. What a great idea for a group activity, and what a job you did with the poem. I never would have thought of something so clever. That is great! Love the lion, love the poem. What a cool idea. Have a great day! Sharon, thanks. To be honest, I don’t write poetry ever. But when we were hit with the 48 word limit, I wrote this out and then saw that it would work OK in poem form as well. Or at least I thought! Sukanya, glad you liked it! you picked a grand lion! who could argue with that proof? Ha ha ha! I love it. So what’s the story with the lions? They remind me of some traveling cows I met once, one of which currently grazes in a front yard right here in my town. Sara, the lions are from The Lions of Lyon series by Seamus (Shameless). Those cows are really something; you’re very lucky to have one so near! I like this project and your lion-y words are perfect. What fun this whole idea is. THat was one good poem! Thanks to you, I adopted a lion(ess) too. Hi, would you please pass this note along to Leonardo? 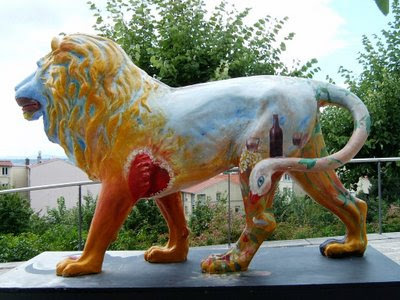 I invite him to come visit me on my new blog, The Literary Lion of Lyon. He would probably recognize me from the blog’s title, but tell him Roary sent the invitation. Thanks. Everyone has a heart-shaped smear somewhere, but few are brave enough to display it. Thanks Heart! Leo is quite brave, isn’t he? I can’t wait until he spills his story….